At the end of December 1944 Biber and Molch type midget submarines and Linse explosive motorboats were sent to Rotterdam and Hellevoetsluis. At the same time, the first type XXVII Seehund midget submarines arrived at Ymuiden. Till the end of the war these Kleinkampfmittel would stage a large number of operations against allied shipping in the Westerschelde. Results of the new weapons were very limited, however. First of all, the midgets could only operate in smooth weather - wind forces below 4 Beaufort. A few dozens of boats were lost by spectacular accidents, caused by runaway torpedoes in Rotterdam and Hellevoetsluis. At the end of the day only one major success could be accounted for, apart of a handful of lesser results: The sinking of the Panamese freighter Alan A. Dale of 4,702 GRT, by a Biber torpedo hit. The overall effect of the Kleinkampfmittel on the outcome of the war can be safely described as all but irrelevant. 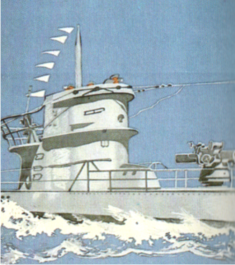 The Kriegsmarine classified the Seehund as operational Uboats (Kleinst-U-boot) and all vessels were assigned official U-numbers (U 2251 - 2300, U 5001 - 5003, U 5004 - 5250 etc). By the end of 1944 construction of no less than 1,000 midget submarines was planned. Finally, 285 were completed, with 93 on the stocks when the war ended. Displacement was 14.9 tonnes. The boats were driven by a Büssing NAG LD6 6-cylinder Diesel engine, which developed 44 kW (60 HP) and was also used for charging the batteries. When submerged an electric torpedo motor propelled the boat. At the surface it could achieve a speed of 6-7 knots. Seehunde were armed with two external torpedoes. The Biber displaced 6.5 tonnes and was driven by a 6-cylinder, 32 HP Opel-Blitz petrol engine when travelling at the surface, when dived by an electric torpedo motor. Its maximum speed was 6.5 knots, Diving depth was 25 meters, and at a 5-knots speed the vessel's range was 125 nautical miles. Armed with two torpedoes. Until December 1944 324 units were produced. The one-man submarine Molch of 11 tonnes was driven by electric torpedo motors, both at the surface and under water and could achieve a speed of 4.3 knots. The diving depth was 30 meters while the boat possessed a 60 nm range at a 3-knots speed. Like the other midgets it was armed with two torpedoes. 390 Boats were built.